Who doesn’t love a good DIY project… even if they A.L.W.A.Y.S end in some sort of argument with your husband. Ami’right? No but for real, I’m the queen of browsing Pinterest and finding the coolest things I want and realizing they are way out of budget, so TGFDIYS [Thank Goodness For DIY’S] LOL. 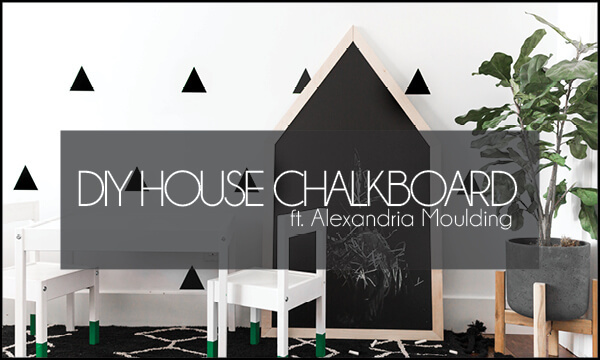 A few weeks ago I found a picture of a house chalkboard and instantly knew Lincoln had to have one which is why I’m super excited to partner with The Home Depot Canada on this project, showcasing the Alexandria Moulding that can be purchased online or in-store at The Home Depot Canada. In case you didn’t know I’m slowly turning Linc’s room into a “big boy bedroom” and incorporating some wood accents along with all his black + white so the maple wood was a must-have, but if you prefer a different type of wood, Alexandria Mouldings has you covered. 2 @ 19 7/16″ length with 18 degree cuts on one side + 53 degree cuts for the peak. Use a table saw and cut a 1/4″ grove in the centre of the Alexandria Moulding 1×2 board 1/4″ deep. 24″ wide by 40″ to the tip of the peak. It’s easiest if you mark centre on the bottom [12″] and grab a tape measure and level to mark 40″ from the bottom [this will be the roof point], then mark the sides up 20″ on either side [this will be the side of the house] and use the chalk line to get a straight line from the top of the side and the peak of the roof. Use either a jig saw or table saw to cut out the house shape. I would HIGHLY recommend a table saw if you have the tools because it’s very important to make the lines as straight as possible so when you go to install the frame it’s easy! Cut the 5 pieces you’ll need to make up the house frame using the Alexandria 1×2 moulding. For reference, I added the lengths and angles we used for our particular project in the “cut list” but I recommend measuring your chalkboard to get exact measurements. Prime and paint the chalkboard. I did two coats of Zinsser Bulls Eye 1-2-3 Water-Base Primer and two coats of the Rust-Oleum Black Chalkboard Paint. FYI don’t freak out when you paint the board and it looks blue b/c I totally did but it dries black I promise! 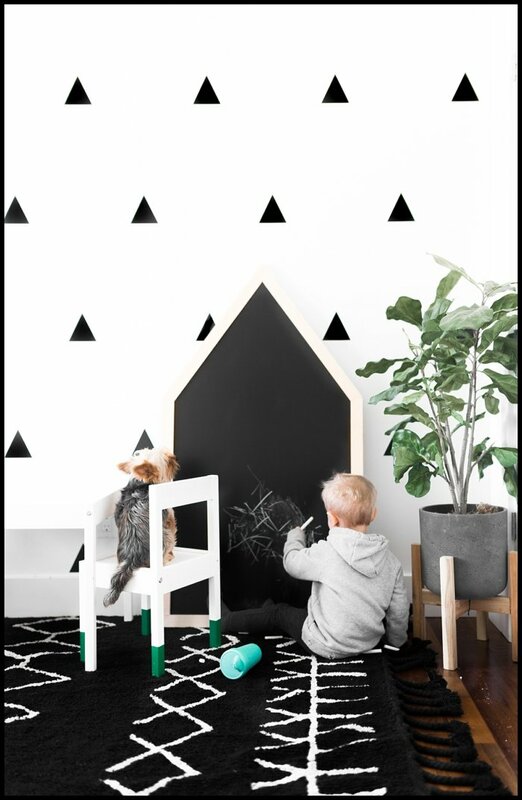 Once the chalkboard is dry and the pieces are cut you’re ready to install. I found it easiest to start with the roof peek and work our way down to the bottom but up to you! I recommend using wood glue on the 5 joints to keep the frame in place. 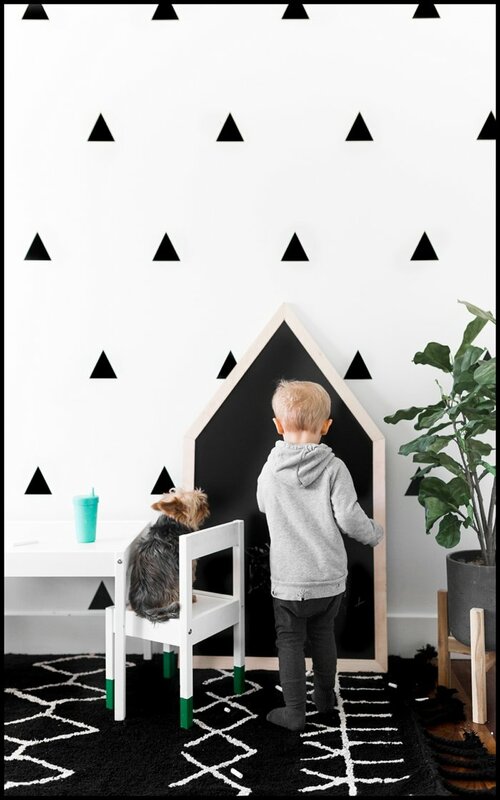 Sit back and watch your kid[s] play with the chalkboard for HOURS… after the paint cures for 3 days that is. – If your joints aren’t perfect, don’t freak out. Mine aren’t either and I’m just going with the “It’s handmade with love, it doesn’t have to be perfect” moto and you should too! – Once the wood glue is completely dry you can absolutely hang the chalkboard if you’d like. Personally, I want to be able to move it around the house but that’s up to you.